Swallow Boats had a stand at the Horning Boat Show in Norfok over the May Bank Holiday weekend. Horning is a lovely setting for this one-day show and Stuart Morris, a BayCruiser 23 owner who was kindly there on our behalf with his new boat, Loulabelle, and long-time Swallow Boats enthusiast Dudley, said that it went very well. Despite a cloudy day the attendance was very good (early reports say 5,000 plus!) and there was a great atmosphere. As well as lots of people visiting, there were plenty of exhibitors and attractions of all things nautical, from a model boat pond and trial sails for novices through to boat sales, and boat themed crafts and clothing, with lots of refreshments to keep everyone going throughout the day. Loulabelle was photographed by the official exhibition photographer and the local paper, so we’ve got a beady eye out to see if they appear in the press, but overall lots of fun was had all round and more people got to know a little bit about Swallow Boats. 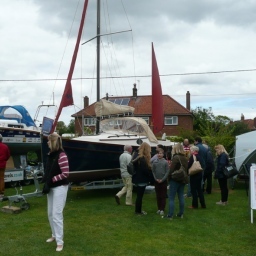 Here’s a photo of our stand, and check the official Horning Boat Show website http://www.horningboatshow.co.uk/ for more photos of the day.